When it comes to weaponry in the Star Wars universe, lightsabers tend to get all the love, leaving blasters to the wayside. Obi Wan may have called them "clumsy and random" in A New Hope, but it’s hard to argue that there’s an undeniable appeal and mystique when it comes to blasters. While fans wait in eager anticipation for Star Wars: Rogue One and Episode VIII, all we can do to pass the time is to keep an ear out for any new reveals. Just this past week, Star Wars unveiled the latest and greatest toys from Hasbro and Lego, a super cool stop motion fan video, along with a neat contest for fans. Still waiting for more updates with bated breath? So are we. For now, let’s console ourselves by checking out some of the most legendary blaster weapons used in the galaxy far, far away. We’re taking a moment to shed some light on some of the biggest and baddest blasters featured in the more recent canon. We’ll also be delving into a closer look at some of the historical guns which inspired the galactic weaponry. We can leave a more comprehensive list up to the folks at Wookieepedia, but for now let’s browse through some of the top blasters that have captured the imaginations of fans around the globe. These are the 15 Best Blasters In The Galaxy. Fans of Star Wars Rebels will instantly recognize Ezra Bridger’s one of a kind design. The blaster-meets-saber weapon debuted during Star Wars Rebels, Season One, Episode 8, "Path of the Jedi". After hearing rumors of a lost Jedi Temple, Kanan discovers the hidden location on none other than Ezra’s home planet, Lothal. Kanan journeys to the temple with his padawan, hoping to discover more information about the Jedi arts. Inside, Ezra is tested with alarming visions of the loss of his friends, but he is guided by the Force and hears the voice of Yoda. After overcoming the challenge, Ezra finds himself with an elusive kyber crystal. Taking a do-it-yourself approach, Ezra got to work on his very own blade. Director Dave Filoni spoke to Slash Film about the weapon, stating that he was inspired to give the blaster an unpolished, homemade feel that was inspired by nail guns and staple guns. After working on it for weeks, Bridger took DIY to the next level by piecing together his unique blaster blade. Hera and Kanaan shared a few spare parts, Sabine supplied modulation circuits and an energy gate, while Chopper lent a power cell to the project. A surprising mash-up of an elegant lightsaber with the brute force of a blaster, Ezra’s hybrid style weapon sounds like a dream come true. An iconic Star Wars weapon, the T-21 heavy blasters can usually be found in the hands of Stormtroopers, Magmatroopers and Shadowtroopers. The T-21 is known for pounding out powerful damage at long range, with it’s biggest drawback being a low rate of fire. Unlike the T-21, the T-21B heavy blaster featured optics, which made it a strong choice for long range combat. The blaster designs draw inspiration from the Lewis automatic machine gun, used by British troops during World War I. In Star Wars Battlefront, you’ll definitely spot these on larger scale maps like Hoth and Tatooine, where players can effectively reach their target from a distance. On occasion, you might see people use them in close quarter combat, but it’s usually just for kicks. It was hard to contain our burst of glee when we spotted a quick cameo in the latest Star Wars: Rogue One trailer. We can’t wait to see what’s in store and to see them in action during the battles of Scarif. The Relby-v10 mortar gun is the favored blaster of the deadly Trandoshan bounty hunter, Bossk, who appeared alongside Boba Fett and other bounty hunters in The Empire Strikes Back. Parts of SW cites the British Schermuly gun as design inspiration, a weapon that was intended for anti-riot purposes. On the top of the gun are two telescopes that were originally used for azimuth tanks in 1943, and it certainly seems like an aptly fitting weapon for a bounty hunter whose name means "Devours His Prey" in Dosh. The Relby-v10 is already available to players in Battlefront, but it will be featured heavily in the upcoming Death Star DLC. The weapon is also known as the Relby V-10 Grenade Launcher, and we’re anticipating more developments and add ons with the new expansion pack. Bossk will be joining the squad of playable villains, and EA announced that his special skills will include regeneration upon kills and deadly grenades. With a sleek design and quick blast capabilities, the DT-12 is known for being the chosen weapon of the bounty hunter, Greedo. The shape is loosely based off of the Ruger MK 1 which was designed in 1949. American designer William Ruger originally got inspired by a Japanese Nambu pistol for the overall design. It may not be as hefty as the DL-44 (further down this list), but the DT-12 makes up for it with it’s snappy, fast firing rate and precision. When it comes to overall damage, the DL-44 certainly has it beat, yet the advantage to using the DT-12 yields a faster firing rate and it’s less likely to overheat. The Rodian might have shot second, but the DT-12 blaster definitely packs a punch. If you’re playing Greedo on Battlefront, use his special skills like precision shot for quick blasts of auto-targeted shots. Or, try pairing the DT-12 with the Explosive Shot Star Card for added oomph. The sly scoundrel from Cloud City, Lando Calrissian, prefers to keep his trusty X-8 Night Sniper at his side. Featuring a specialized scope, the viewfinder enhances the user’s vision with infrared heat-sensitive night vision for added accuracy. Also manufactured by BlasTech Industries, the blaster pistol has a special mode that can be used to silence the weapon. Lightweight, easy to port around, the X-8 Night Sniper made appearances in the original trilogy and more recently in Star Wars Rebels. During Season One, Episode 9, "Idiot's Array", Lando made a brief appearance as a so-called "galactic entrepreneur”. Although Ezra wasn't too impressed with the smuggler's charm, Lando's gunslinging skills came in handy when fighting the criminal Azmorgian. Battlefront fans have been experimenting with X-8 Night Sniper since the release of the Bespin DLC in July. Reading through its specifications, it might seem like a gun to sleep on, but the computerized scope is helpful in areas with low visibility. We recommend trying it out on maps where it’s harder to see, like Twilight on Hoth or the Forest Moon of Endor, where Rebels and Imperials alike seem to blend in with the background. The X-8 Night Sniper is one of the only blasters in the game that lets players see through Star Cards like the Dioxis and Smoke Grenades. The BlasTech A280 is known for being the most commonly used weapon by Rebels during the Battle of Hoth. The design is directly based off of the German Maschinenpistole 44, or MP44 assault rifle during WWII. The weapon is also known as the Sturmgewehr 44, or StG44, which is more commonly referred to as an assault rifle. The rifles were also in full use when the Rebel Alliance fought Imperial forces on Endor. In Star Wars Battlefront, the weapon is known for being fairly balanced, delivering powerful damage and working well with long distances. Although it’s firing rate is not quite as fast as the smaller sized pistols, the A280C makes up for it with damage. You’ll be most likely to spot this type of rifle on bigger scale maps, and is closely compared to the Imperial issued E-11. The A280C has a faster rate of fire than the E-11, but puts out a lower amount of damage. To compensate, try teaming the A280C with the Explosive Shot star card for an extra boost of power. The RT-97C heavy blaster rifle was more commonly used by Stormtroopers, and was known for having longer range capabilities. The blaster was first shown in the hands of a sandtrooper in A New Hope. IMFDB cites that the weapon was originally inspired by the MG 15, a German machine gun used in the early 1930s. Further research also shows slight inspiration from the Maschinengewhr 34, or MG 34, which was another German machine gun introduced in 1934. In similar suit to the DLT-19, used by other Stormtroopers and the bounty hunter Dengar, the RT-97C can be seen as a more enhanced, amped up version due to the addition of a scope. In Battlefront, the DLT-19 has a lower amount of damage, but makes up for that with a faster rate of fire. Players often pair the RT-97C heavy blaster rifle with the Cooling Cell Star Card to reduce the cooling rate and allow for more bursts of damage. The RT-97C is akin to a portable machine gun, and is commonly used on larger scale maps. It definitely has a different feel from the more commonly used blasters like the E-11, EE-3 and recently added EE-4. Utini! You might remember the CA-87 blaster from when R2D2 was ambushed by a pack of Jawas in A New Hope. Upon first glance, these weapons might look more like flare guns than actual combat weapons, but when used in close quarters, the user can get sense of their true power. Battlefront fans may have been skeptical about the gun, but players had to amass kills with the blaster to unlock new Star Cards through Jabba’s Hutt Contracts. Not for the trigger happy or the faint of heart, these guns have a powerful blast but also have a very slow cool down rate. Using the CA-87 requires the right amount of timing, making the blaster extremely powerful in close quarter combat, but practically useless with vast, expansive maps. Although the CA-87 was designed for very short range, the weapon was loosely inspired by the British Lee-Enfield bolt-action rifle. Parts of SW notes, "The .303 British rifle was originally used during WWII. For the blaster prop, most of the wooden front section was cut off and the barrel was shortened. The rifle buttstock was also severely cut down sanded and stained a lighter color." “I like this thing…” Han said with a grin to Chewie, after sending off an explosive blast towards two Stormtroopers in The Force Awakens. The Bowcaster weapon is synonymous with Chewbacca, but the bounty hunter Embo was also known to use it during the Clone Wars. Star Wars Databank calls them, "...more powerful and accurate than blasters, firing a metal quarrel encased in plasma energy," Yet, in Star Wars Battlefront, the Bowcaster can tricky to maneuver, firing off a spray of three powerful blasts instead of one. If you've mastered the element of surprise, a deadly jump pack combo with a spray of Bowcaster fire will yield lethal results. Designed to look like a futuristic crossbow, the Bowcaster is a handcrafted weapon made from a combination of wood and metal. Although its hefty size might seem a bit bulky for mere mortals, having added weight makes it perfect for the warrior Wookiee. It’s certainly helped the heroes out of a bind or two. Battlefront fans will finally get to see the Wookiee in action with the upcoming Death Star DLC, set to launch this month. Produced by BlasTech Industries, the DH-17 is described as a fully automatic blaster pistol that was commonly spotted with Rebels aboard starships. The original design for the DH-17 is based off of British submachine guns such as the Sterling BSA Experimental Model 1949. "The BlasTech DH-17 was used by both sides in the Galactic Civil War. Rebel Fleet Troopers used this blaster, but it was also the weapon of the Death Star Troopers. It was considered the workhorse of the blaster pistols and had a slightly longer range than most models." Tim Veekhoven describes in his article, Star Wars Blasters: So Uncivilized, But So Awesome. Practically a go-to weapon for rebels, the DH-17 blaster is an ideal choice for stealth tactics, especially when compared to bulkier weapons like the T-21. A lightweight frame makes the blaster easy to wield for Rebels of practically any shape or race, from Quarrens and Rodians to sneaky Sullustans like Nien Nunb. “You might need this.” Han told Rey after landing on Takodana, right before paying a visit to Maz Kanata’s castle in The Force Awakens. Rey might have looked skeptical when she received the NN-14 blaster pistol from Solo, but it looks like the blaster certainly came in handy in the long run. Originally manufactured by LPA, the Star Wars: The Force Awakens Visual Dictionary notes, “The blaster featured a compact grip, enlarged power core, reinforced frame, a safety switch, armored body shell, and flash suppressing/stabilizing muzzle.” The blaster has a smaller shape than other pistols, making it portable and ideal for close quarters. The compact shape is reminiscent of the SoroSuub ELG-3A blaster pistol wielded by Padmé Amidala. The weapon was also known as “The Diplomat’s Blaster” and was commonly used by Naboo civilians and royalty. The NN-14 also shares a similar resemblance to the defender sporting blaster pistol, which was seen in A New Hope when Leia was first introduced on screen. Fans have already crafted their own versions of the NN-14 blaster pistol, using newer methods like 3D printing or simply making alterations to lesser detailed toy gun replicas. In the riveting final scene of The Force Awakens, Rey is seen with the NN-14 holstered at her side, and we’re eager to see more of it in action in Episode VIII. Another blaster rifle manufactured by BlasTech Industries, the DLT-19 was a heavy blaster rifle used by Stormtroopers. With a rapid rate of fire, the weapon could deliver a volley of blasts at long range. In the films, you might remember spotting the weapon in the detention block when Han went undercover in A New Hope. The blaster is modeled after the MG 15, a German 7.92 mm machine gun used in the early 1930s. In similar vein, the DLT-19X targeting rifle was another variation of the blaster rifle, and was favored by snipers. The DLT-19X lacks the rapid fire pace of the original DLT-19, and instead yields a powerful single shot blast with a much longer cool down rate. In Star Wars Battlefront, the gun requires precision and timing for accurate sharpshooting. “You’re gonna take a dirt nap.” Dengar, the mummy-wrapped bounty hunter who made a short appearance in Empire Strikes Back, was recently added to the Bespin DLC for Star Wars Battlefront in July. Although Dengar is shown carrying the Valken-38 in Empire Strikes Back, he is equipped with the deadly DLT-19 in the game. "Dengar has wielded different weapons through his appearances and we decided to give him his most iconic weapon, the DLT-19, making him our only Heavy Blaster Hero so far." EA announced in a recent statement. Don’t let its looks deceive you; the gun may look less than promising, but what it lacks in initial damage, it makes up for in speed. When he’s not tossing around a dizzying array of explosives, Dengar’s the one to pick for a frenzied rush of pellets and delivering a flurry of blows to opponents. One of the more ubiquitous blasters, the E-11 blaster rifle is known for being the standard Imperial blaster, issued to all Stormtroopers serving the Empire. Manufactured by BlasTech Industries, the lightweight blaster rifle was actually an upgraded version of the DC-15A blaster, which was originally wielded by clone troopers. The blaster offered a sense of versatility, and was made to be used in a variety of environments. Featuring three types of settings, the E-11 could be set to lethal, stun and sting. Although we've heard that the blaster is capable of more than 500 shots when loaded with plasma cartridges, the reason behind why Stormtroopers perpetually miss their target still remains a mystery. The original design for the E-11 blaster was modeled after the Sterling submachine gun, a British weapon that was used in the 1950s. Parts of SW has amassed a detailed list of modifications, including information about the types of scopes used. When it comes to bounty hunters, few can match the prowess of Boba Fett. Although he might be known for his signature jetpack and grappling hook, the EE-3 carbine rifle at his side is nothing to sniff at. Wookieepedia notes, "It was an optically fitted blaster rifle capable of three-round burst fire at long ranges, but had lower accuracy and stopping power compared to larger rifles.” If you’re playing as Boba on Star Wars Battlefront, toggle the R-3 button to take advantage of the scope capabilities. The triple burst of fire works well on medium range maps, and can be particularly tough to beat when paired with the Explosive Shot star card. The EE-3 blaster rifle was originally based off of the Webley & Scott No. 1 Mark I flare gun, a British weapon used by troops during WWI and WWII. The weapon has also been shown in the Clone Wars series, toted by other bounty hunters like Sugi, and captured in more detail alongside Fett in Return Of The Jedi. In fact, the original EE-3 prop in Empire Strikes Back featured a sling, but was later removed for Return Of The Jedi. Blaster enthusiasts can take a quick closeup of the weapon when Luke slashed the blaster in half during his epic skirmish with Boba. If you’re looking for one of your own, authentic looking prop replicas will cost you a pretty penny, while more run of the mill versions can be found on Etsy for around $79.99. 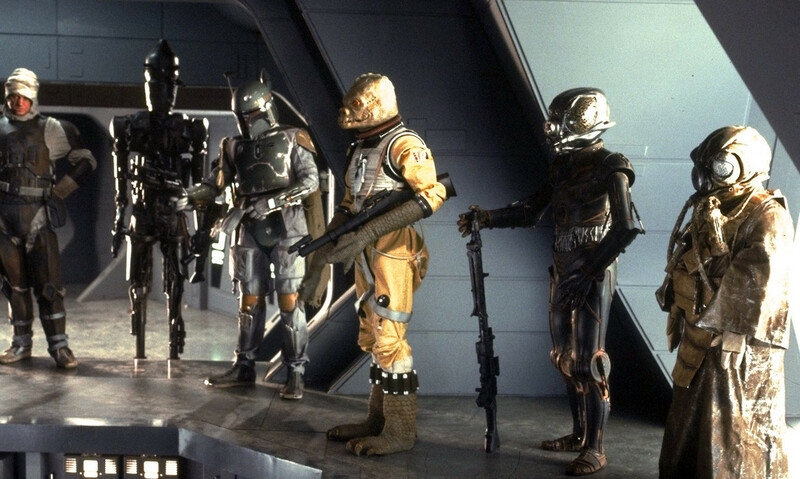 The enigmatic bounty hunter may have had a woefully small amount of screen time in the original series, but we’re more than a little hyped for the rumoured Boba Fett Anthology Film set for 2020. "Hokey religions and ancient weapons are no match for a good blaster at your side, kid," Han Solo told Luke while aboard the Millennium Falcon in A New Hope. Few can forget the memorable training scene when Han scoffed at the idea of the Force, pledging his allegiance to his trusty DL-44 at his side. One of the most prized possessions of this scruffy lookin’ Nerf-herder, the DL-44 is arguably one of the most well-known weapons in Star Wars. The blaster was originally inspired by the Mauser C96, a semi-automatic German pistol which was made from 1896 until 1937. Also nicknamed as the “Broomhandle”, the C96 was spotted on the silver screen before Star Wars, appearing in the 1967 film, The Naked Runner with Frank Sinatra. DIY enthusiasts have been known to purchase actual historical guns or close replicas for their own iterations of the DL-44. Scott Juarez from Crucible Custom Props crafted an incredibly detailed, actual working version of the DL-44 based on the C96, and outlined his entire process here. Jerry Miculek unveiled the weapon and tried it out at the range, where he made a record 6 shots in 0.8 seconds. In many ways, the DL-44 is a lot like Han himself: bold, just a little reckless and willing to put everything on the line. With a surge of powerful blasts, the blaster definitely knocks the competition flat, but with a small caveat—it overheats quickly, leaving yourself vulnerable if you miss. No matter which side of the ‘Who shot first?’ debate you’re on, the DL-44 is an ideal weapon for any galactic gunslinger. Other honorable mentions include the compact DL-18 blaster pistol, the SE-14C blaster pistol, a favorite for Battlefront fans, and the Sonn-Blas F-11D blaster rifle wielded by Captain Phasma, which we hope to see more of in the future.